Liturgical and secular music has been an integral aspect of the culture of the Carpatho-Rusyn immigrant community in the U.S. Within the Rusyn churches, congegational and choral singing provides a spiritual and artistic outlet that enriches the lives of the singers and members. The musical leadership in a parish, whether provided by a cantor, choir director, or both, in many instances extended into educational leadership within the parish and even into secular Rusyn cultural activities such as plays – predstavlinja, concert performances, and strolling caroler groups – jasličkari/Betlehemci/gubi/zvizdari. 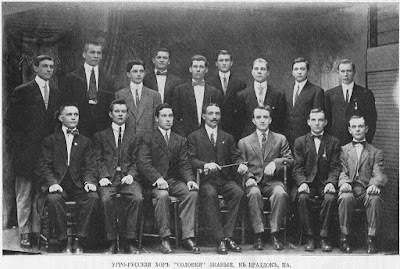 "Russkij Chor" (Rusyn Choir), Lansford, Pa., 1924. 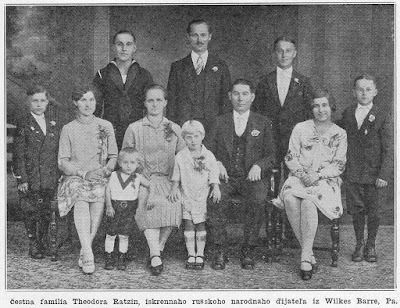 Seated, left of center: Very Rev. Gabriel Martyak, former administrator of the exarchate; to his right, Mr. Andrew Doboš, supreme president of the United Societies; to his left, Mr. Andrew Vapensky, teacher/director. 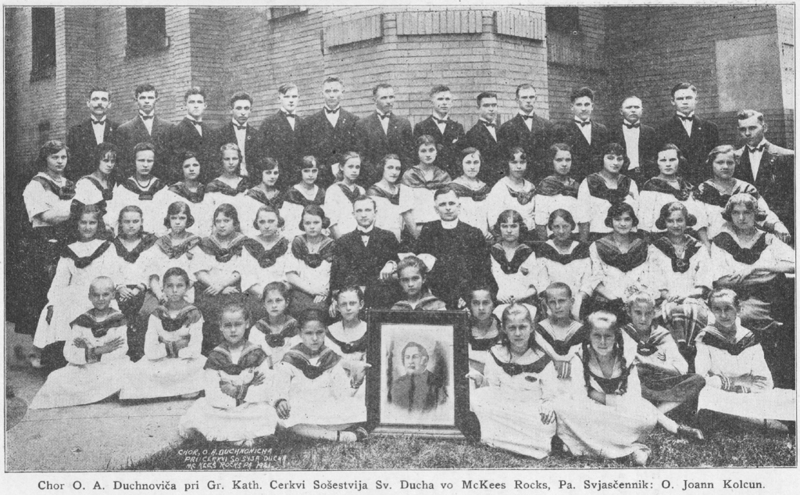 Choir of St. Mary Greek Catholic Church in Wilkes-Barre, Pa., 1909. 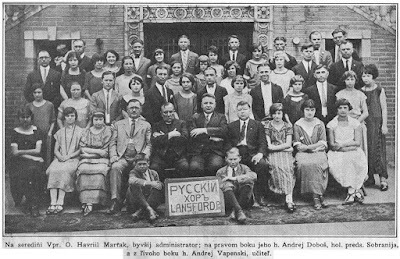 As I write the history of Carpatho-Rusyn communities in Pennsylvania, I will do my best to chronicle the tenures of cantors and choir directors in all of the parishes, of whichever jurisdiction. 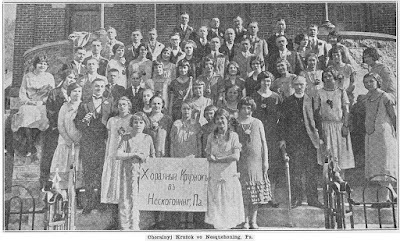 Cantors and congregational singing, whether of the Subcarpathian or Galician traditions, were part of not only Byzantine Ruthenian Catholic and Carpatho-Russian Orthodox parishes, but also Ukrainian Greek Catholic & Orthodox and even some Russian Orthodox parishes of Carpatho-Rusyn origin. 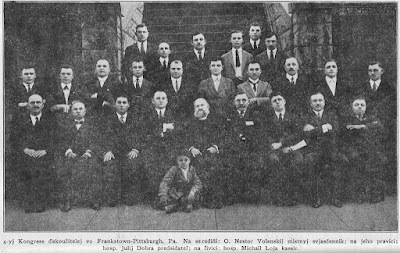 Fourth Cantor-Teachers' Congress in 1922, Frankstown (Greenfield) - Pittsburgh, Pa. Seated, at center: local pastor Fr. Nestor Volensky; to his right, Mr. Julius Dobra, president; to his left, Mr. Michael Loya, treasurer. The Metropolitan Cantor Institute of the Byzantine Ruthenian Catholic Archeparchy of Pittsburgh has begun two related projects that intersect with that aspect of Rusyn American history: documenting the facts and history about parish cantors and parish choirs. We are looking for information about where and when each of these individuals learned church music; where they served as cantors; documents, photographs or recordings, if any exist, and (most importantly) personal remembrances of their work as cantors. In the case of cantors who also composed or arranged church music, we would like to assemble either a complete or representative sample of their work. The collected information will be used to document the history of our church singing, foster our plain chant and choral singing, and honor our cantor forebears. It will also be shared with the parishes where these cantors served. Family of Michael Loya (Mychayl Loja), McKeesport, Pa., 1918. 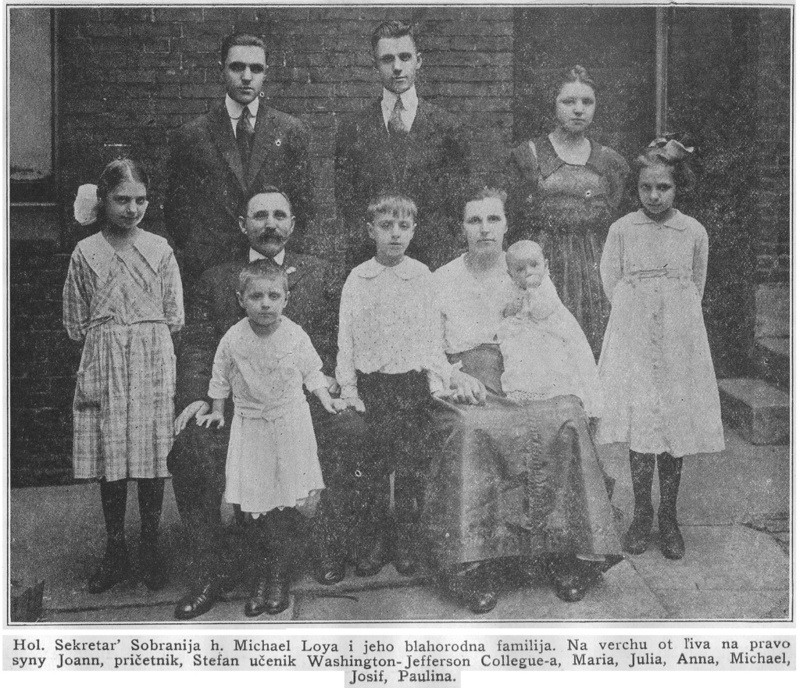 Standing, left to right: sons John and Stephen (both of whom became priests); first row, right to left: Maria, wife Julia, Anna, Michael, Joseph, and Paulina. Loya was cantor-teacher at St. Nicholas Greek Catholic Church in McKeesport and the supreme secretary of the United Societies. Fr. 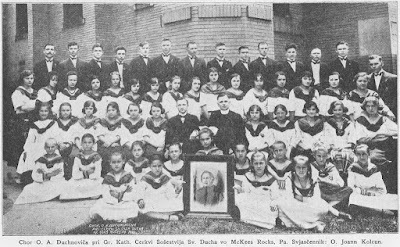 Aleksander Duchnovič Choir of Holy Ghost Greek Catholic Church in McKees Rocks, Pa., 1921. Pastor: Fr. John Kolcun. Throughout the history of our church, there has sometimes been competition for “pride of place” between congregational singing of plain chant, and the singing of choirs (whether of harmonized chant, or of choral masterworks). The singing of our notable choirs has not only added beauty to our church in the past; it can also be used in the present to enhance and supplement our congregational singing, and show us how chant was understand or harmonized in the past. And where choirs can be re-founded or formed, they can provide opportunities to train singers in the liturgical services of our rite, and add social activities based in the parish community. Did the choir have a “signature” piece, and if so, what was it? This information for each choir will be assembled, put online, and used to complete a history of our church’s musical tradition. 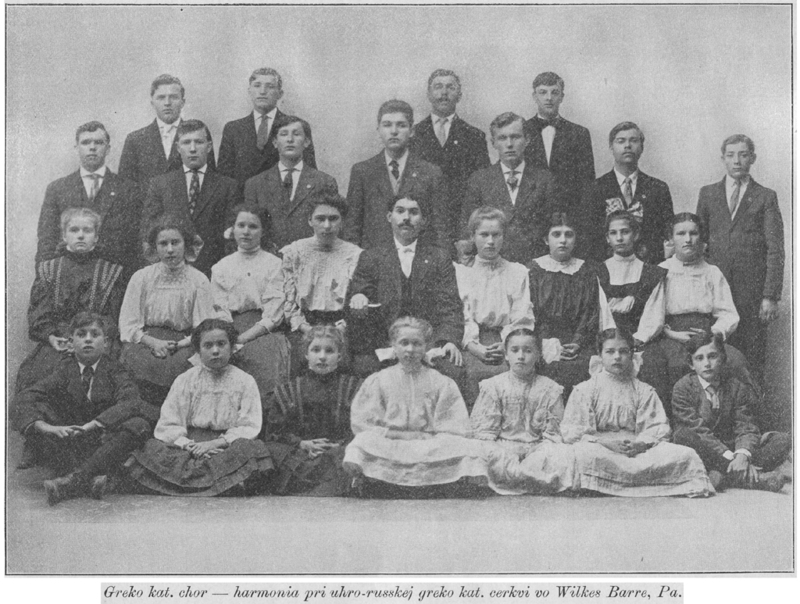 In some cases, the MCI can provide some basic historical information from diocesan newspapers to anyone willing to write a history of a particular choir. If you can contribute to either project in any way, please contact Deacon Jeffrey Mierzejewski at plainchanter@gmail.com, or by calling (412) 735-1676. Watch the MCI website and Byzantine Catholic Seminary website for updates. Uhro-Rusyn "Solovej" Choir of Ss. Peter & Paul Greek Catholic Church, Braddock, Pa., 1911. 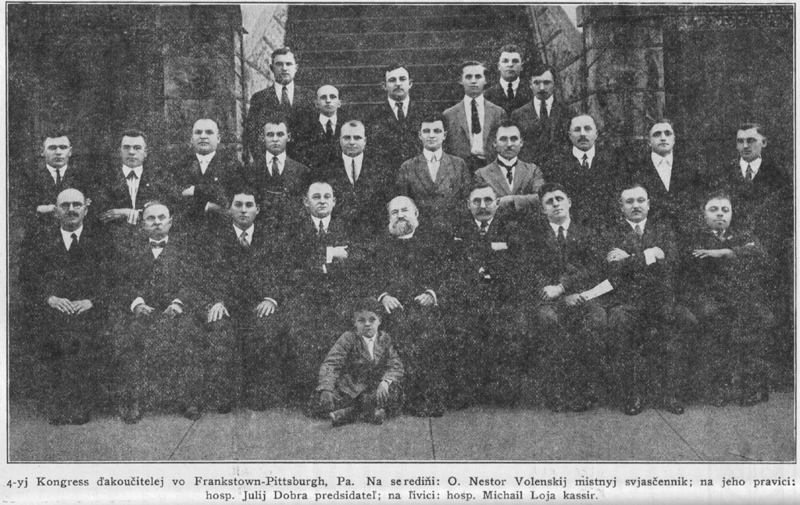 Choral Society of St. Mary Greek Catholic Church, Nesquehoning, Pa., 1925.